Professor William D. Brown, Albert B. 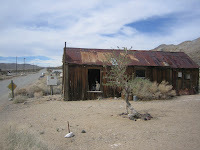 Elder, and A.C. Hanson, three outstanding citizens of Inyo County, quietly stole a number of priceless silver claims that had been legally located and recorded by Raphael Cuervo. The Coso Mining District records had been altered and recorded dates changed such that the three aided by attorney Pat Reddy became owners of The Defiance Silver Mine the location of which defined a new town called Darwin. The town formed up on the west side of the northwest trending Darwin Hills at the edge of Lucky Jim Wash. It reached its peak in 1877 with a population of between 3,000 and 4,300 - an estimate based on the 33 saloons located there at that time. Main Street had businesses you’d find anywhere included harness makers, boarding houses, a stagecoach office, breweries, freighters & packers, bathhouses, livery & feed stores, a gunsmith, a chop house, a jail and of course saloons. An estimated 200 framed houses neatly occupied lots along defined streets. The miners came mostly from Panamint City - a community decimated in 1876 by a flashflood that swept away most of the town and a number of silver milling operations. By the time they arrived, the Darwin Hills had been fully prospected and claimed. These men, mostly of Irish and Welsh extraction, found work inside the existing mines as drillers, blasters, and sorters for the going wage of $4.00 a day ($90.00 current dollars). Ore from the Defiance and other mines in the district required special treatment in large furnaces -- a process called smelting. In this process, molten silver is separated from other minerals and formed into 60 pound bars for shipping. By the end of 1875, there were three smelters that served 20 mines in the district. Shootings and robberies occurred here with regularity as they did in other mining camps of this period. Of the 124 deceased buried on Boot Hill, only two died of natural causes according to one writer. Actually, the records show that at least six of the 124 occupants of the Darwin Cemetery died of natural causes. Jack occupies the most famous unmarked grave in the Darwin Cemetery. Shorty Harris, a prospector well known in these parts, had been involved in the discovery of a number of mining camps including Bullfrog, Nevada and Harrisburg located in the Panamint Mountains at the edge of Death Valley. A small man standing only five feet he personified a burro prodding prospector of the period. 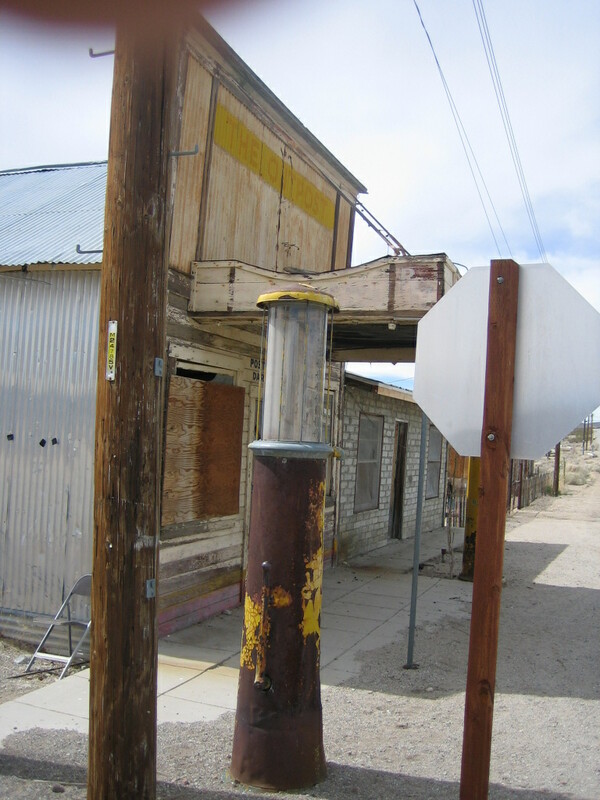 It was said that he made frequent visits to Darwin from his home in the Panamint Valley. Death Valley Scotty, a character well known in Darwin, spent time in the local taverns on his way to and from Death Valley. Remi Nadeau, owner of the Cerro Gordo Freight Company, had an office in Darwin and was considered part of the community. George Hearst, best known as the father of newspaper publisher William Randolph Hearst, owned a number of mines in Darwin and also the Modoc Mine near Lookout. Being a graduate mining engineer, he well understood the geology and mining potential of the Coso District. Father John J. Crowley, the Padre of Death Valley, owned some mines in the Darwin Hills and in later years would stop in town on his way to Death Valley to hold services. Lake Crowley located in Mono County was named in his honor. Interestingly, no church of any denomination could be found in Darwin. Baby Face Nelson, Public Enemy #1, was spotted eating at a restaurant in Darwin. Rumors circulated that Chicago gangsters on the run from federal authorities were hiding in isolated cabins near Darwin Springs located at the edge of Panamint Valley. By 1880, the higher grade oxidized silver and lead ores had reached depletion. This meant that deeper lower grade ore would be mined at a higher cost per ounce of silver which would, unhappily, reduce returns to shareholders. The mining companies faced two options either closedown mining operations and wait for more favorable economic conditions or reduce expenses by cutting the miner’s daily wages from $4.00 to $3.00. They decided to reduce wages. ng to cross a picket-line to work. Some militant union members issued a threat that anyone working for $3.00 a day risked a beating or possibly hanging. The Superintendent of the Defiance Mine called upon Deputy Sheriff Welch and Constable Fitzgerald for protection of the miners entering and leaving the mine. Welch agreed and prepared to challenge the strikers as soon as he could roundup a posse. As the evening shift began arriving at the Defiance Mill, they were met by a line of angry armed protesters. At about the same time, Deputy Sheriff Welch, Constable Fitzgerald and three deputized citizens came on the scene with shotguns and pistols. It’s not clear what happened next. The record shows that one of the deputies shot and killed one of the protesters. According to one witness, the shooting caused such confusion that those protesters representing the worker’s union quickly evaporated into the night. The strike ended a few days later, the union disbanded and the men went back to work at three dollars a day. In the mid-1920s, Darwin became the western automobile entrance to Death Valley. A 30 mile toll road was constructed with private money. The road stretched cross desolate Panamint Valley, ascended the western face of the Panamint Mountains and ended at the Stovepipe Wells Hotel. It became known as the Eichbaum Toll Road. 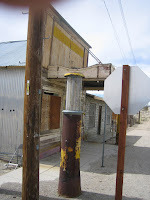 In 1936, the state acquired part of the toll road and constructed a standard two-lane highway from Olancha on Highway 395 to Death Valley -- a road that by-passed the town of Darwin. Darwin is now a ghost town with a small population. In fact, the population is so small (36 in the latest census) that you are not likely to meet anyone as you drive around snapping pictures of scattered ruins. The dwellers here apparently make an effort to stay of out of sight when infrequent visitors arrive. As you drive into the valley on Darwin Road, you will see the buildings and tailing of the Defiance Mill representing the final days of mining activity on Darwin Hill. Ownership of the consolidated mines passed through numerous hands until Anaconda Copper acquired the properties in 1945 and continued to produce lead, zinc and silver until 1955. The plant is now idle. On a recent visit my friend and I met Helen, a middle aged, well-seasoned desert dweller, who has lived most of her life in Darwin. She told us that folks here are self-sufficient and get on well without television and that the town has no commerce of any kind. No lodging, no gas and no shops selling the usual trinkets and no public telephone. Emergency calls to the Inyo County Sheriff’s Office are made by whoever they can find with a cell phone. News from the world outside comes mostly from newspapers that arrive at the post office daily. I asked Helen why there’s no “Darwin” sign at the turnoff from the highway. She said that apparently the locals didn’t want it replaced. In keeping with the desire of the 36 independent-minded, I promised Helen that I would not give directions or Google map location for Darwin in this story. Note: The black and white photos displayed are courtesy of County of Inyo, Eastern California Museum.